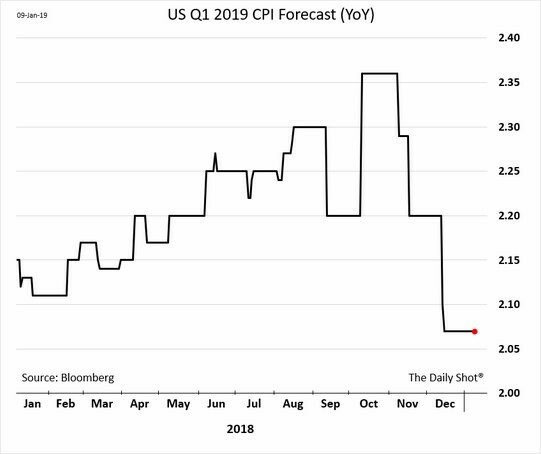 In November, I started discussing how the Fed didn’t need to hike rates in December or in 2019 because inflation was cratering. Now is a great time to be a worker because inflation is falling and wage growth is rising. The labor market is filling up which means many people are benefiting. This explains why retail sales were strong this holiday season. The crash in oil prices played a major role in the decline in commodities prices. Even with this decline, the Fed went ahead with the December hike. The Fed’s hawkishness last fall was partially responsible for the volatility in stocks. That could have been avoided if the Fed reacted quicker to the weakness in inflation. Finally, in the Minutes from the December meeting, the Fed stated the modest inflation allows the Fed to be less hawkish. As you can see from the chart below, the average Q1 year over year CPI forecast fell from 2.35% in early November to about 2.05% now. The Fed was late to the party in expecting lower inflation. Fed might be late again as the Bloomberg CRB commodity ETF is up 5.18% year to date. It needs to increase much more to push up headline inflation, but that’s a start. If inflation were to spike, we could see a modest stagflationary environment. It wouldn’t be anything like the 1970s-1980s, but it wouldn’t be ideal. The bull market from 2009 to 2018 lived off modest growth and low inflation. Fears about the JOLTS report are wildly misguided. The labor market is strong. The most obvious way to prove this is the great December labor report. The JOLTS report is from November, so it will never be a leading indicator that will predict turns in the cycle. If you want a leading indicator, look at the jobless claims report. The chart below shows the negative argument. The downturn in new hires is circled. However, it’s easy to see the numerous 3 month periods which were about the same as this.